[toc]Myopia or nearsightedness is a vision problem that many people face. The biggest problem for myopics is that they are unable to see distant objects and all they can see are blurs instead. There are certain herbs which can be used to cure myopia and also prevent this condition from worsening further. These herbal remedies include Chicory, Bilberry, Indian Gooseberry, Licorice and Eyebright. These herbs are very useful in curing the problem of myopia. For most people who have myopia, improving visual acuity of distant objects is the basic aim and using herbs is a very good and effective way to ensure that this occurs. Myopia can be a problem if it is left unattended. Proper medical care can be effective but herbal remedies are a natural way to cure this problem. 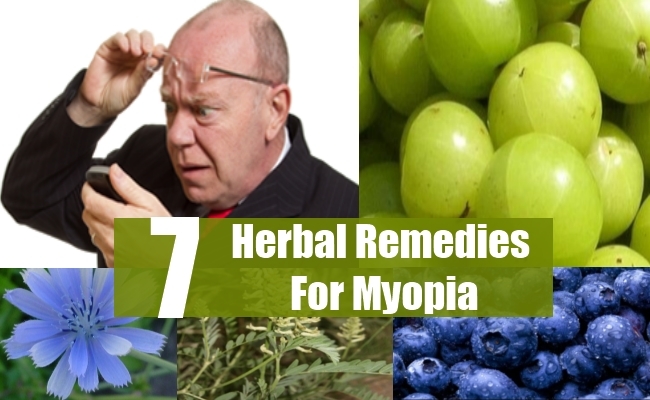 This article showcases which herbal remedies to use for myopia. 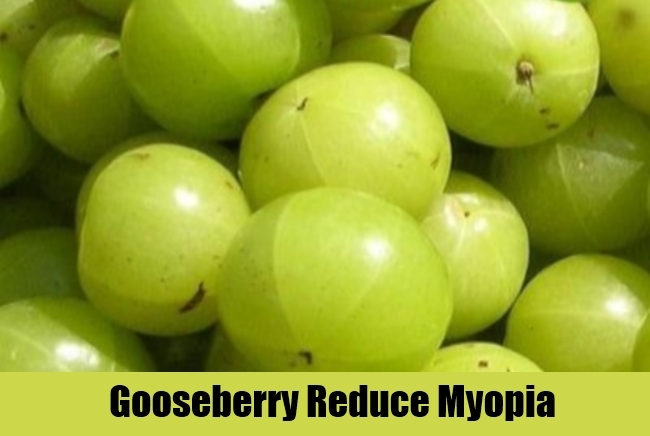 Indian Gooseberry also known by the botanical name Phyillanthus Emblica is an amazing herbal cure for myopia. This herb has been used in ancient Ayurveda to make the mixture called Triphala which is very good for curing most vision problems. Indian Gooseberry fruits can be consumed for treating myopia and improving your vision. You can also drink a solution containing the leaves of this herb for enhancing your long distance vision. You can also take the juice of this herb along with a dash of honey for good results. Bilberry closely related to Blueberry, is a herb which can protect the eyes from radical damage. This is because Bilberry contains anti-oxidants which refresh and revitalize the eyes. Bilberry also improves circulation and enhances blood supply to the eyes. This enhances eye vision by oxygenating the eyes. 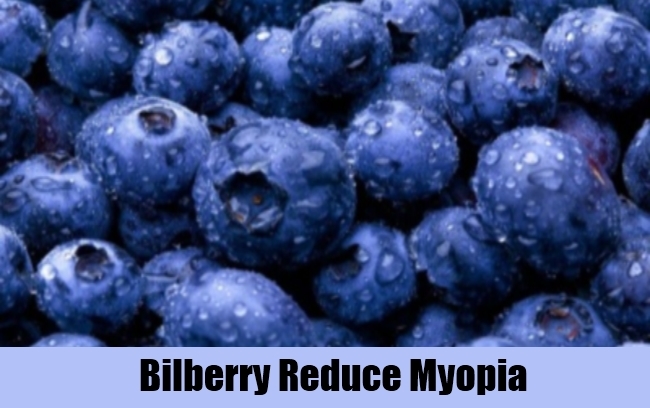 Bilberry is very effective in curing myopia. It also reduces macular degeneration in the eyes. You can take an extract of this herb for best results. You can also take Bilberry herbal tea twice in a day to improve vision and ward off myopia. 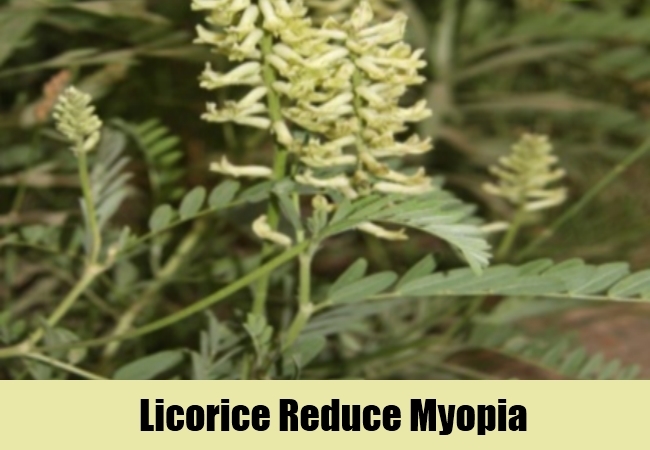 Licorice is a very effective herb for curing myopia. This is because it possesses anti-inflammatory as well as healing properties. Licorice is very effective in improving the sharpness of vision and ensuring that the eyes regain good health. Milk, honey and butter should be added to powdered Licorice root and this mixture should be consumed for best results. This mixture provides the nutrients that the eyes need in order for vision to improve. Licorice has been used in ancient Indian Ayurveda and traditional Chinese medicine because of its revitalizing and regenerative properties. It is these properties which make it an excellent cure for myopia. Chicory or Endive is also a very good herb for curing myopia. This is because it is rich in vitamin A. Vitamin A is very important for improving vision and it is necessary for the eyes to function in a healthy and effective manner. You should mix Chicory juice with celery juice, carrot juice and parsley juice and consume it daily for improving your vision and curing myopia. 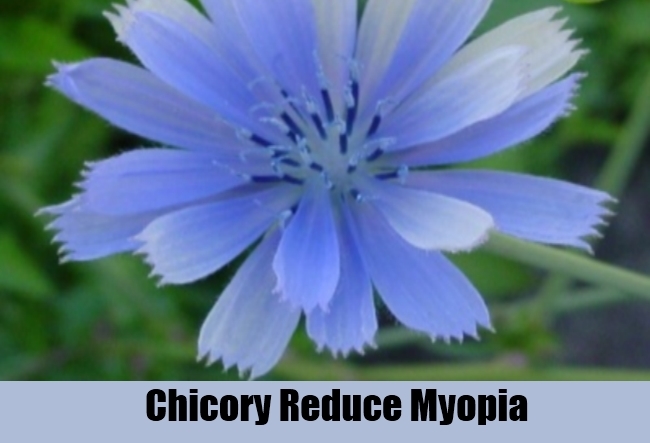 Chicory is a very effective herb for curing myopia because it possesses the right nutrients to nourish the eye and improve vision. This herb is called as Eyebright because of its remarkable ability to heal and energize the eyes and improve vision. It is used for most eye related ailments and it is an ideal cure for myopia. Eyebright has anti-inflammatory and antibacterial properties. It is used for various eye disorders and problems of vision. You should boil the dried leaves of this herb in water and then strain the liquid. Soak a compress in the strained liquid and apply it to your eyelids regularly for relief from problem of nearsightedness. 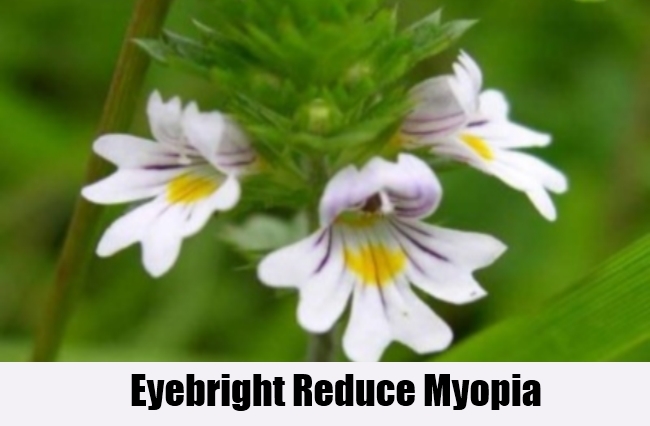 Eyebright contains tannins which reduce inflammation, ward off eye irritation and improve vision. Eyebright is a herb native to Europe. 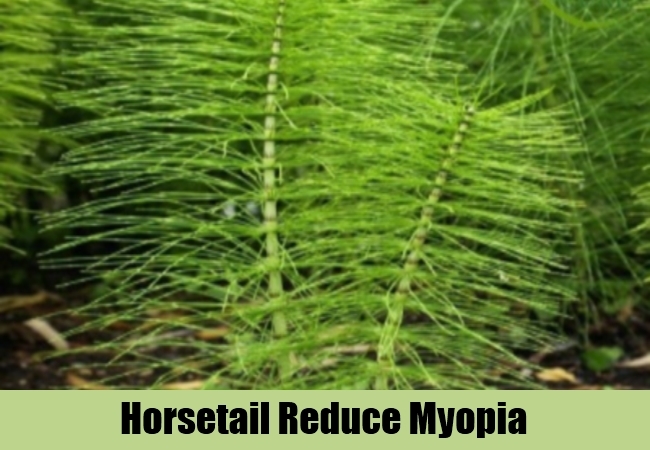 Horsetail also known as Equisetum Arvense is a good herbal cure for myopia. This is because it possesses anti-inflammatory properties and it is also very effective in reducing the eye strain caused by vision related problems such as myopia. It is also used to prevent the deterioration of vision. You should soak 100 grams of this dried herb in I liter of water and then soak the liquid in a cotton cloth. Place the wet cloth across your closed eyelids for relief from eye strain and improve your vision as well. This herb has dual benefits because of which it is a very popular herbal cure for myopia. 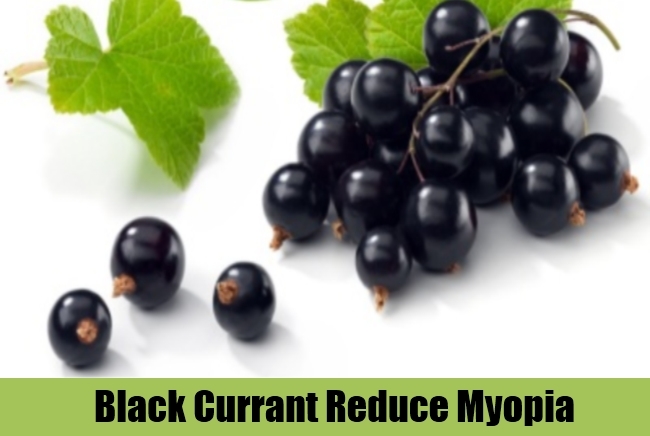 Black Currant is a very effective herb for curing myopia. Also known as Ribes Nigrum, this herb is well known for its constituent flavanoids which improve the condition of persons suffering from nearsightedness. It is available in tincture and syrup form readily and it is an ideal herbal remedy for myopia. This herb has the natural healing power to improve visual acuity and sharpness of vision. Black Currant is a good natural herb for curing this problem and providing lasting relief. Black Currant extract has been known to also prevent the development of myopia in persons prone to this eye condition.